If you know me, then you know how much I love using Adobe Products. All of the logos, banners and even the paper background on this website were all created from scratch within Photoshop. Along with that, I also have this guilty pleasure of using Premiere Pro and After Effects to make little "pump-up" videos for my ECU Pirates (as seen below) -- don't judge me. So naturally, when I heard that Adobe was putting on a contest that involved their products, college students and money -- I was instantly interested. 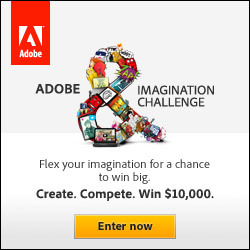 From August 22nd through October 30th, Adobe is having a contest where students (like yourself) can create something using their suite of software's in order to win one of four $10000 cash prizes. You heard me right -- 10000 big ones!! Now, unlike my poorly put together football video below, the content you create must be completely original (and actually interesting). It doesn't have to be a video -- it can be any digital creation of your choosing, as long as it was made using one (if not several) of Adobe's Suite of software's. I know - I know...I can hear you complaining already, (*whinny voice*) "I'm broke and I don't own any Adobe software". Well never fret, you can grab a fully functional free trail of CS5.5 good for 30-days, which should be plenty of time for you to finish that masterpiece of yours. The contest is being judged by Jake and Amir from CollegeHumor.com (the comedic guys), DeadMau5 (the creative guy), Rivers Cuomo of Weezer (freaking LOVE Weezer), and Scott Dadich the VP of digital magazine development at Condé Nast (the really important guy). They will be choosing the four winners, as well as a overal winner that will win another -- you guessed it -- cold hard helping of 10 Grand. So what are you waiting for? Click Here for submission dates and information, and start getting your creativity own!